Thermoplastic coated # 11 ga. punched steel with rolled edges forms the 46" Sq. (3 Seat ADA - 46" x 57", 2 Seat ADA - 46" x 68") table top and seats on this uniquely designed octagonal picnic table. 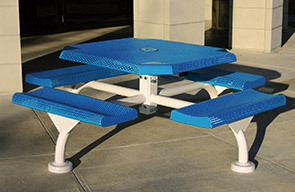 The powder-coated heavy-duty frame adds strength and durability to this attractive yet functional picnic table. Available in universal access, these octagonal picnic tables are the perfect solution for satisfying ADA Accessibility Guidelines. The in-ground models have an extra 18" length on the frame legs to allow for permanent installations. The other models have standard mounting plates that can be either bolted down to concrete/asphalt for surface mounting applications or left un-bolted for portable applications. For that final finished look, solid cast aluminum grout covers are available. Cover color will match the frame color. 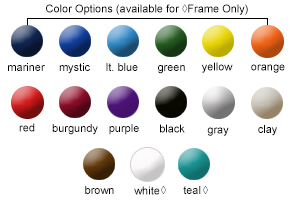 Table top and seats are available in the color options shown below, in a lightly textured matte Polyethylene finish. Punched Rolled Steel Top & Seats. All wheelchair access octagonal picnic tables, conform to latest ADA specification.